Harmondsworth, Middlesex, Great Britain: Penguin Books , 1949. First Edition Wraps + glossy pictorial DJ Near Fine in VG DJ Horizontal 8vo (9-3/4 x 7), 52 pp (18 text pages, 32 plate pages -- 16 color & 16 B&W). Paperbound book is NEAR FINE, all pages clean and tight, with only a 1/4" vertical tear on the bottom of the back cover. Glossy pictorial DJ is VERY GOOD, unmarked, appears fine at first glance, but with a tear missing 1" x 1/4" upper back DJ at the flap, small vertical tear top of spine, now repaired, small (1/2") circular stain bottom front of DJ and some minimal crimping on top edge. 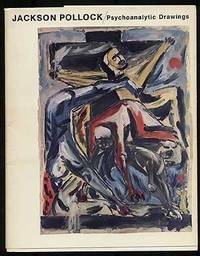 By Pollock, Jackson; Wysuph, C.L. New York: Horizon Press, 1970. First Paperback Edition Paperback AS NEW in Very Good + DJ 4to (8 x 10), 123 pp including Bibliography and 83 plates 16 color and 67 B/W.. Trade Paper book is FINE -- Unread, Unmarked, and AS NEW in AS NEW white wraps and VERY GOOD Glossy pictorial DJ with some shelfwear, slight bumps on top and bottom of spine of DJ and price ($5.95) intact but small diagonal clip on bottom of French Flap. An extraordinary collection of Mr Pollock's barely known and rarely seen figurative paintings becoming abstract that pre-date the later style for which he is best known, with an excellent essay by Mr Wysuph calling attention to influences and analyses. Doctor Who: Timeview: The Complete Doctor Who Illustrations of Frank Bellamy. Brauer: Oils, Gouaches, Watercolours & Etchings. By Brauer, Joachim Jean Aberbach, Pierre Restany. 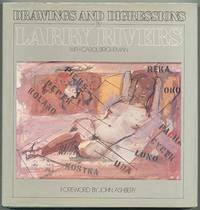 Drawings And Digressions by Larry Rivers. By Rivers, Larry; Brightman, Carol. Foreword by John Ashberry.